Collaborative thinking can help foster creativity. If the collective works the right way, a group studio has great potential to help visual artists bring out more original and exciting ideas. Why not learn from the best in the creative field; Pixar Studio. Pixar Studio is known for animation movies like Toy Story and The Incredibles. In the world of creative industries it is renowned for being the model of a cutting-edge, forward thinking, innovative company. 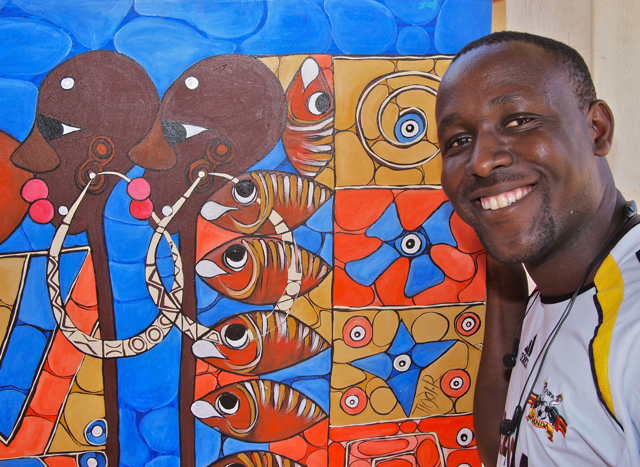 Maybe most relevant for the East African art scene are the principles and guidelines for team creativity which they base their work upon. 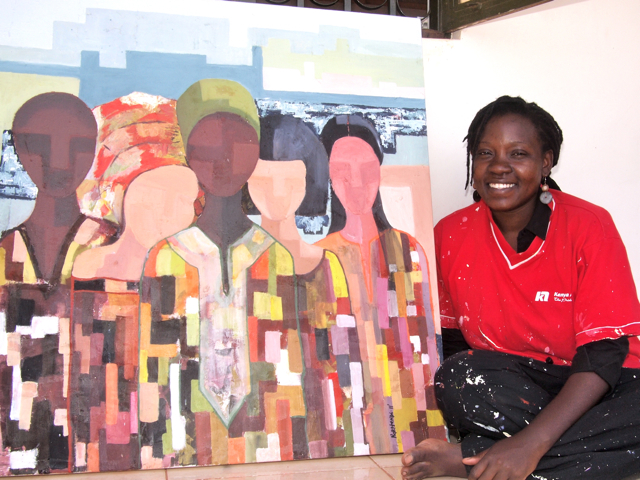 Kampala is currently home to at least three group studios, providing an artistic space for close to twenty visual artists. Startjournal has spoken to a dozen of these artists to find out whether the lessons learned from teams like Pixar would be applicable for the field of fine arts. At the end of the day, the Pixar teams work towards one shared end product, which of course makes it different from a group of individual artists producing separate art works. Nevertheless, when reading about Pixar’s approach to creative work, there are good reasons for why these collaborative techniques and guidelines may work for a group that produces many individual objects. Like all great advices, some of these principles would feel a matter of course. 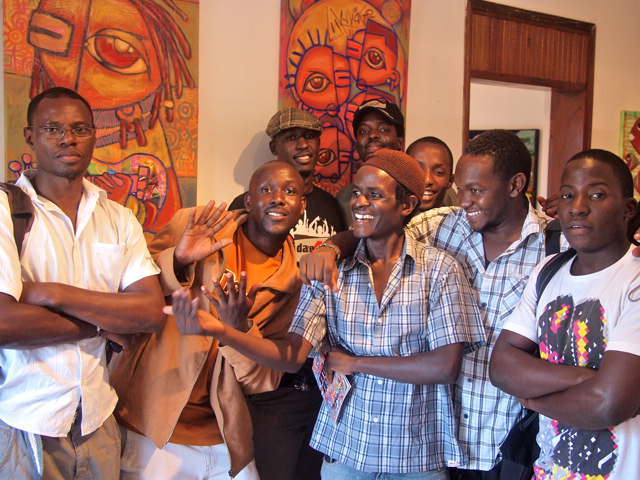 But Startjournal wanted to discover the inner dynamics of the group studios in Kampala, and initiate a discussion with group artists using these guidelines as a backdrop. 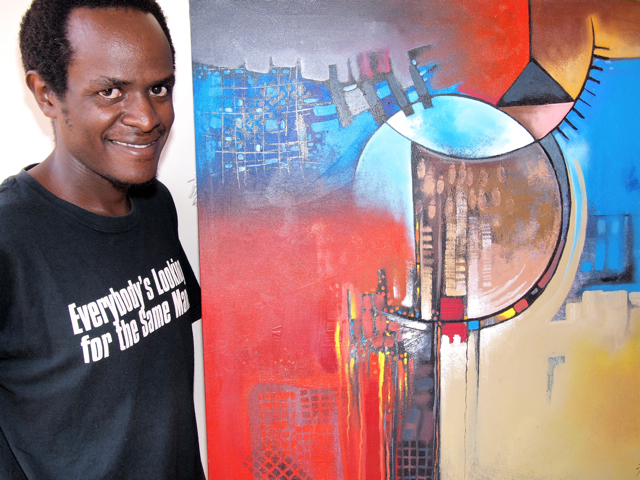 Artpunch Studio is the home of frontman Wasswa Donald and fellow visual artists/fashion designers Amos Sentongo, Sheila Nakitende and Nabukenya Hellen. They work from a new studio in Kansanga and they have been operating as a group since 2007; with Nakitende joining last year. 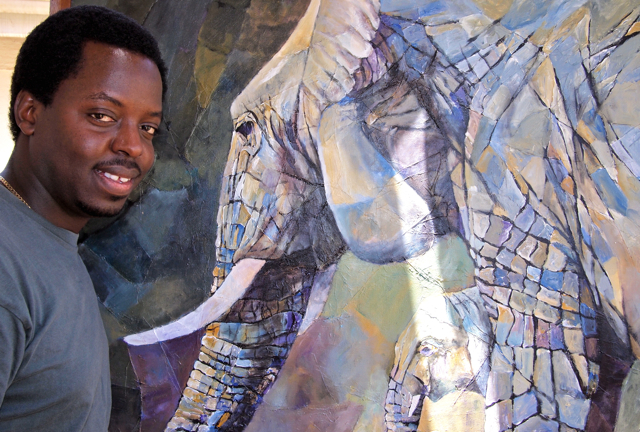 Donald: "In this painting, Amos taught me how to incorporate the use of collage in the background"
Sheila: "In this one, the group helped me understand form and perspective"
Looking around at the different art works in the studio, this writer would agree to the notion that there is a certain common denominator to the creations. These days more than one group member seem to explore the effect that splattered paints will have on different media, ranging from canvas to shoes, bags and mirrors. Hellen: "The group advised me how to apply paint to cover the whole of the edge of the sole"
Out of the three groups Startjournal spoke to, Artpunch seems to be the group which best have adapted the guidelines of coming up with imaginative ideas, implementing them as they arise, and seeking allies outside the group to test and give feedback to such ideas. 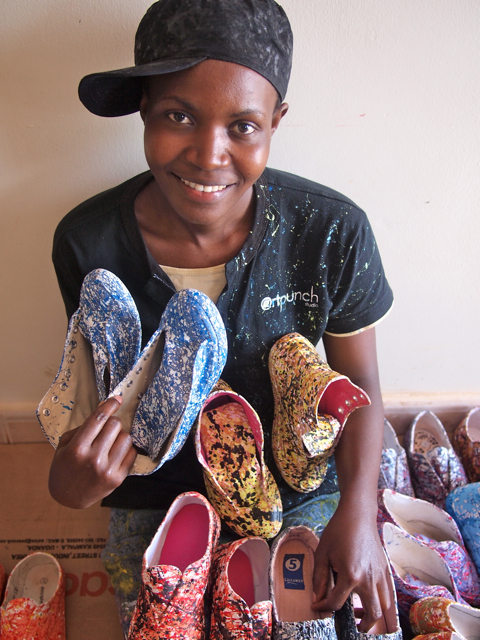 Wasswa explains that this is more an ongoing process than consciously using collaborative techniques to foster product innovation. 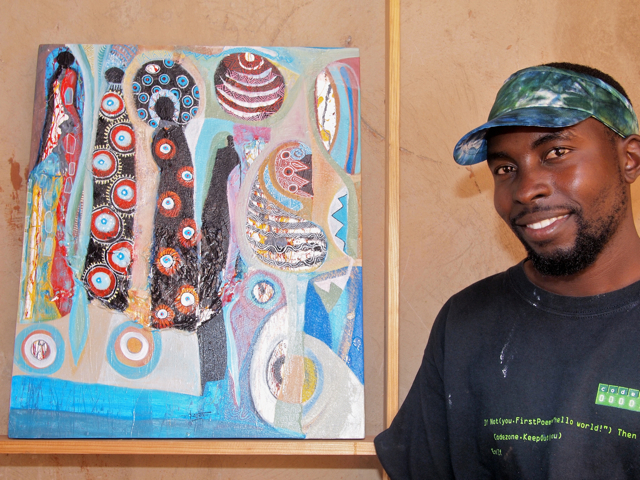 Wasswa further explains that these processes are ever-present, quite unformal and based on a trust and honesty in the relationship. ”A kind of trust and honesty that was an important factor for me when I decided to join the group,” adds Sentongo. 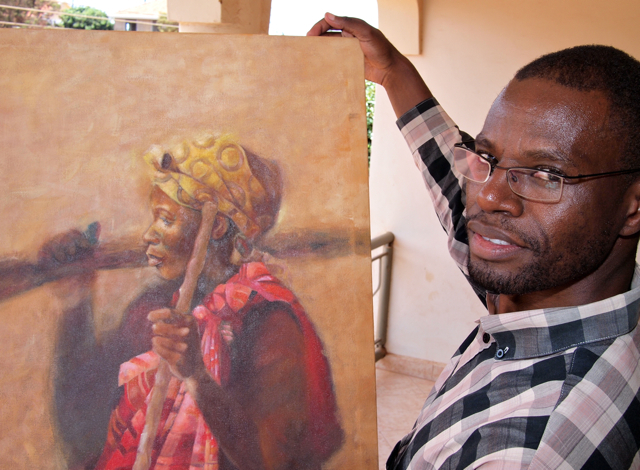 Amos: "I was adviced by the group to make a personal painting, hence the use of fabrics to relate it to my background as a fashion designer and depicting the women to pay tribute to the women I was raised by"
Njovu Art Studio is a result of some members leaving Gecko Studio in late 2009. This split demonstrates another fundamental principle of teamwork. There is a need for a shared group ideology and artists who team up for similar reasons. When talking to some of the group members, there seems to be an immediate point to explain why Gecko didn’t work out and reasons for this group to come into being. 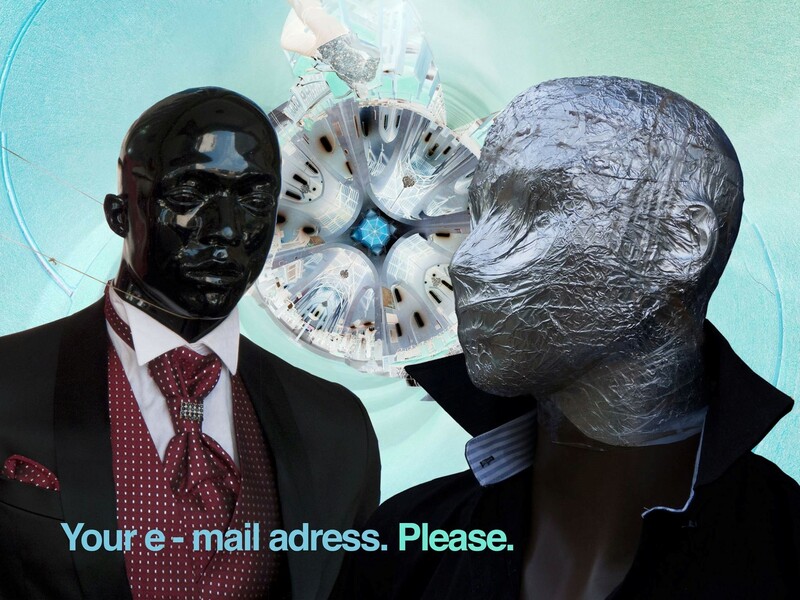 But after Startjournal explains that this article is forward-looking, the Njovu artists are happy to share their view on which are the important factors to base a collaboration on. Arnold: "Damba suggested that the arm in the background should be brushed off to leave my usual realistic touch"
”We have a democratic approach to everything we do. When somebody from outside contacts a group member with a request, our next step will be to gather the group and discuss how to act,” Mark Kassi adds. ”One advantage there is by working in a group, which makes everybody more creative, is just the fact that everybody see what you do. One technique we sometime do, is to challenge another artist to do something differently. 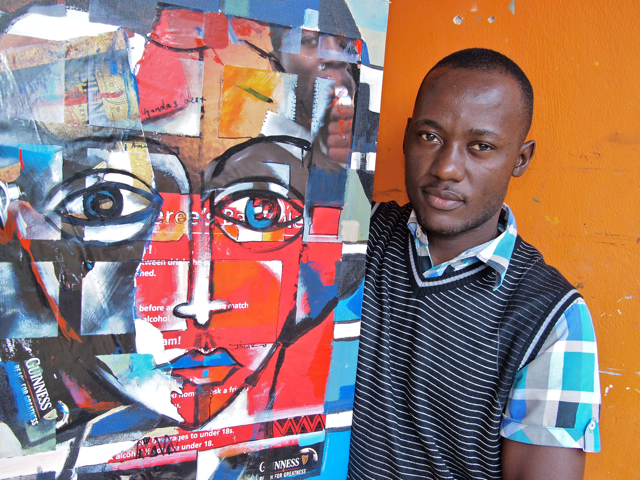 For instance, I would ask Arnold to make something abstract,” explains Damba. Damba: "Anyone in the group is free to comment and react"
The displaying of ideas and the openness to comment, discuss and criticize more or less finished art works, seems to be the guideline these visual artists easiest recognize. ”One thing at least Mark and I used to do a lot – even though we hadn’t established it as a formal collaborative technique – was to hang a newly finished painting on a nail just outside the entrance. This meant we were open for – or even yearning for – others to critique it,” Tindi explains. Tindi: "The group challenged me to add more details in my work and how to compose them"
”An important factor in the group is that we are all open for the idea of criticizing and be criticized. It is an ongoing process, we are always asking colleagues to comment what we are working on. But it is also important to say that it is done with a certain degree of humour. Sometimes we throw out a funny comment, just to break the ice,” Mark Kassi adds. Kassi: "The group adviced on how to apply and finish the dark background to the left"
When the group is presented with some of the other guidelines for innovative team work, it is apparant that some of artists are applying them on an individual basis, but seldom consciously in formal group processes. 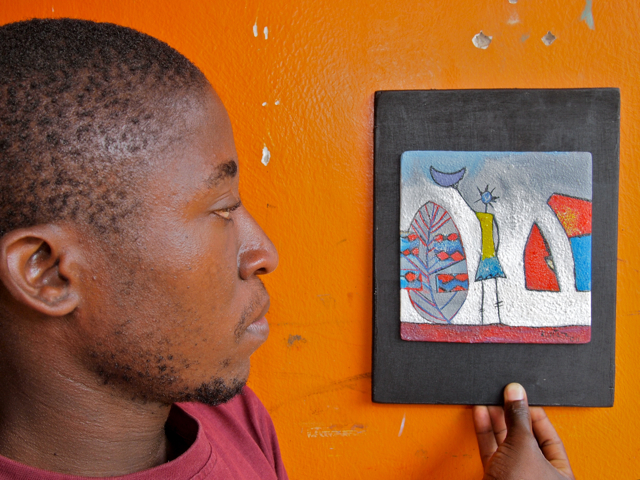 Similar conclusions can be drawn after speaking with a third group, with equally many members as Njovu; Ivuka Art Studio. They share a history by arising out of Gecko studios. 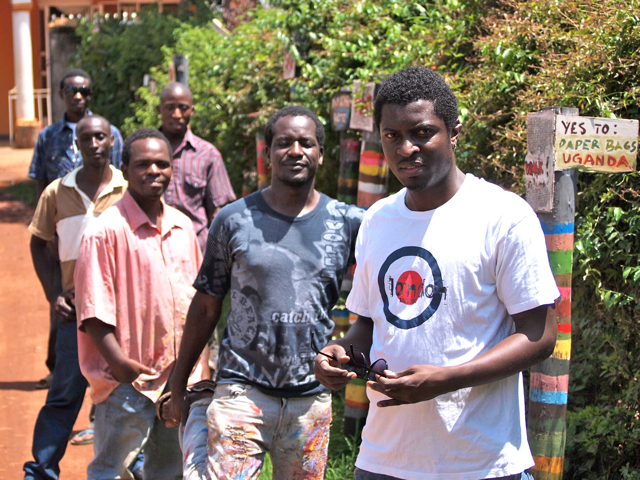 Startjournal meets five of the members; Jjuko Hoods, Anwar Sadat Nakibinge, Paul Kintu, Patrick Kyeswa and Albert Walozi, in their second floor home base in Bukoto. In addition, the group currently consist of Collin Sekajugo, who introduced the current name, Ssebandeke Mohamed, Ibrahim Kitimbo and Cathrine Kabugo. 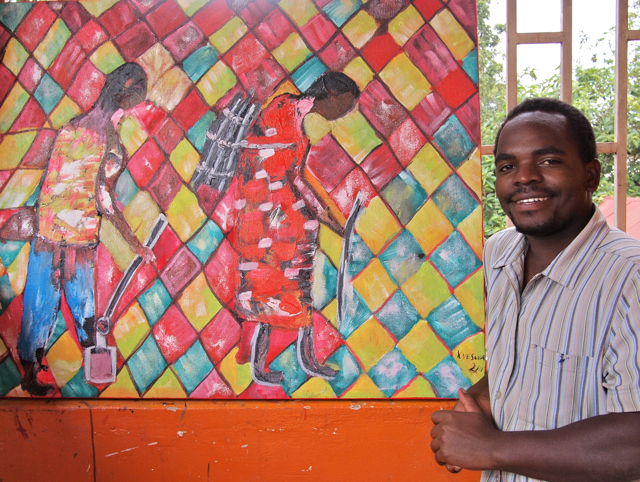 Jjuuko: "The group inspired and challenged me to use old posters as a collage"
The group members feel at home when we discuss principles like ’using financial restrictions as strength’. These artists are used to work with limited resources, experimenting with all sorts of free and accessible media and material, and producing their art on things like old posters, jeans and other waste objects. 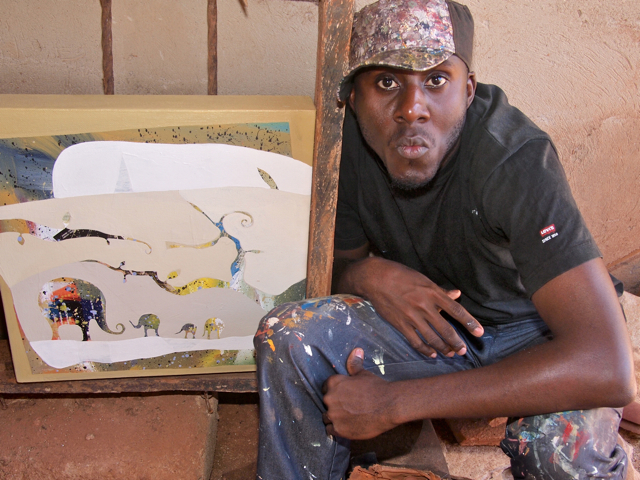 The more experienced group artists like Jjuuko Hoods and Anwar Sadat Nakibinge points out that one of the core values for this studio is to embrace young artist that comes from scratch. 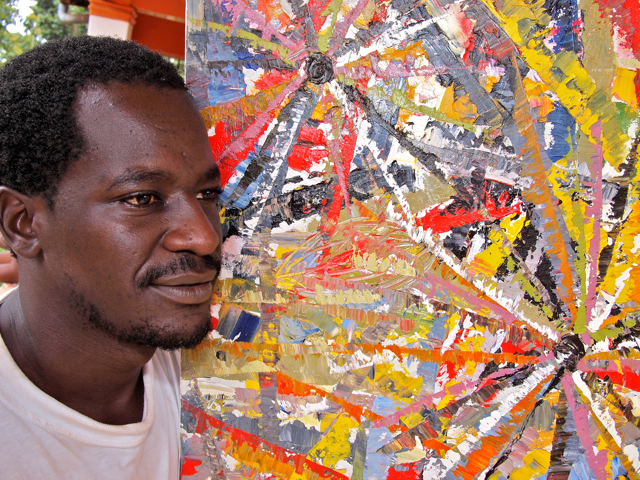 Albert: "The other artists adviced me on how to build the patterns, the shapes, the colours and distribution"
Anwar: "The group challenged me to use oil paint instead of acrylics"
”I would say that our ways of giving feedback are spontanous, they are very direct and open, and always with the intention of giving specific advices,” adds Jjuuko. Upon the topic of building alliances to outside players, this group has always been engaged in community projects. 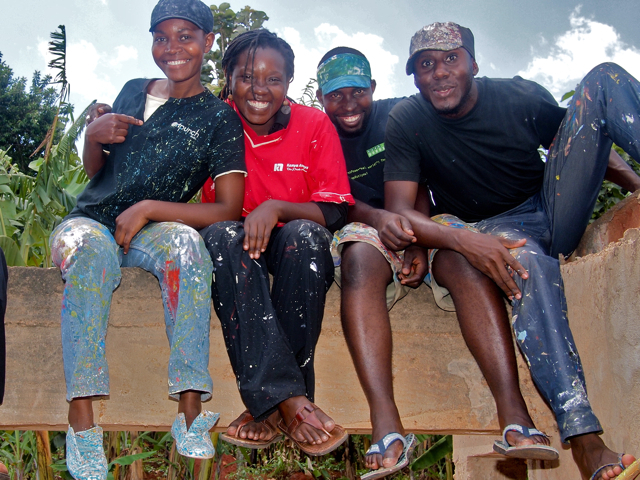 They were approached by and teamed up with Aidchild and Nsambya Babies Home, and has actively worked to establish a relationship with Kansai Institute. 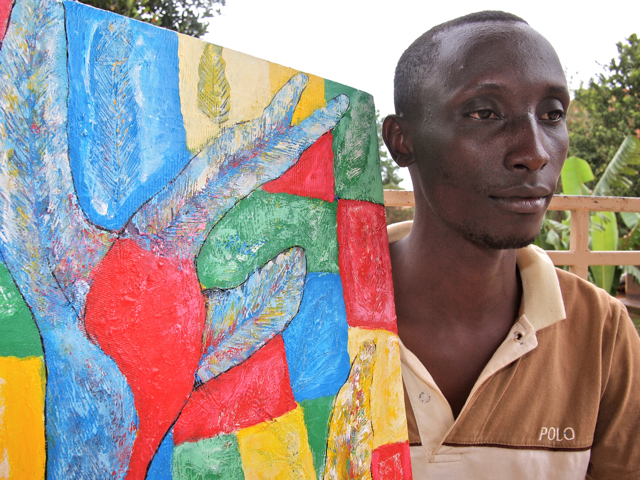 Engaging themselves to help the Mulago and Masaka communities, have also been important steps that underlines their slogan ”Using art to change lives”. Paul: "The group adviced me to attach the small painting to a dark background, hence giving it a more powerful appearence"
Patrick: "In this painting the group adviced on how to carry out the diamonds in the background, how to work on the outline and the colour in them"
After having visited and discussed these issues with three of the leading group studios in Uganda, this writer has a feeling that the collectives are doing great things for individual artists. Which contributes a lot to make each artist stronger and more confident than they would have been in splendid isolation. Nevertheless, one can not help thinking that some simple collaborative techniques and guidelines may help to break up the tradition of the ongoing, yet quite spontanous teamwork that exist today, and maybe challenge the groups to think outside the box. great article and its so touching that these are the only groups of artists in uganda but am happy coz all the three groups share one origin. Great article, I believe the spark for new generational ART lies right here with collaborative design/art. Wow what a great article Thomas,thumbs up!! I couldn’t agree more on your ending paragraph of a need to add simple collaborative techniques and guidelines to ”outgrow pond and head for the lake” but i also think documentation like what you’ve is a very good start for this issue! kuddos mate! I can’t even begin to describe my enthusiasm while reading Mr. Bjornskau’s wonderful article here at startjournal.org. First of all, the group name “punch” is perfect to describe both the team spirit and collaborative effort, AND impact a piece has on all who behold it. I love Mark Kassi’s comment about adding humor to what can be a stressful situation – listening to the critiques of our work. Also, Jjuuko’s comment about “spontaneous” and “specific” feedback…both important because “in the moment feedback” is effective when delivered appropriately and with true caring for the receiver. As a board member of the Holland Area Arts Council in Holland, Michigan, I can tell you the slogan “Using art to change lives” is exactly why we exist. I will be sharing this article with my colleagues and also with visitors to our Capodagli Jackson website. Well written article. It is cool to see all these generation Next…artists collaborate.